Ralph Stanley is not immortal. In spite of refrains — at least half a dozen at the Pittsburgh Three Rivers Arts Festival alone — of his status as a “living legend,” Stanley is 86 years old and frail. One half of the first-generation-of-bluegrass duo The Stanley Brothers, as well as a solo artist in his own right, Stanley might have just a few years left in him. He already can’t play his famous clawhammer-style banjo. On Saturday, his band, the Clinch Mountain Boys, gave Stanley a lyrics sheet so he could remember the words to “Angel Band”, a song which someone in the crowd requested. A song he must have sung hundreds of times. Earlier in the show, Stanley called Nathan, his grandson, and the technical lead singer of the Clinch Mountain Boys, “Ralph Stanley Jr.” Nathan quickly corrected him, saying “I’m your Grandson” and made it clear to the crowd that the rest of the band also knew that this was Pittsburgh (woooo!) and not “somewhere in Ohio?” as Ralph mumbled or inquired as if he didn’t much care. (I know I didn’t). The Clinch Mountain Boys do carry Stanley. They play lots of songs that highlight their impressive playing and singing, especially Nathan’s a-little-too-smooth style. (Nobody was smooth like Ralph’s late brother Carter, who was silk and butter, but not shiny, uncomfortable vinyl. Carter drank himself to death in 1966). Christened in his childhood church days — Primitive Baptist, so services only allowed vocals, no musical instruments — as “ the boy with the hundred-year-old voice,” Stanley may not reach the century mark that would officially grant him having grown into that voice. Yet his age and stature surely make more sense when you hear him sing now. And he can sing. When Stanley sang “Rank Stranger,” I got that elusive, hair-raising feeling that goes beyond just being happy to be there listening. It came when Ketch Secor and Critter Fuqua sang “River of Jordan” in the Little Grill in Harrisonburg, VA last year. I felt a ghost of it when my friends Jason and Stephen played and harmonized on “Little Birdie” last summer. But the Stanley Brothers’ arrangement on “Rank Stranger” is something else. In their version — and the Clinch Mountain Boys echoed this on Saturday — Carter starts clear and strong, “I wandered again/ to my home in the mountains….” Ralph is faintly harmonizing here, but first it’s all Carter on display. His voice is classic country, but not unpleasantly so. He’s sad, earnest, warm — and then Ralph takes the second verse with “everybody I met seems to be a rank stranger” and his eerie, ancient voice brings the song to an entirely different place. The contrast in the brothers’ vocals — familiar and unearthy together — hits your spine, your knees, everywhere. That voice is not as strong as it was at his peak, but it’s still there, that high droning power. While Stanley sang “Rank Stranger” I just clutched at the hem of my dress and felt so happy I could melt. In those moments, I want nothing, and it’s wonderful. He sang “Little Maggie,” and “Mountain Dew,” and “Roll in My Sweet Baby’s Arms” and other Stanley standbys, too. He didn’t need the lyrics sheet again. The acapella version from the O Brother Where Art Thou soundtrack won Stanley a Grammy in 2002 and cemented his place in the history of country music. He earned that decades before, but the delighted reaction to the song — a dirge straight from the hills of Appalachia with unknown origin — is entirely justified. But it’s still strange that it’s so popular. The lyrics, addressed to death, are frightening to anyone who has suffered a moment of existential angst. I don’t like to listen to it very often. I don’t want to sap it of its power. Also it’s really scary. At the Art’s Festival, when Stanley began “Death/O Death/Won’t you spare me over for another year,” my only concrete thought was a prayer; let people — for once — shut up. There were some “woooo” and “owww” sounds at the start, but I was in the front and in my earshot people shushed the loud folks. For most of the song, most of the people were silent. In fact, I have never heard that powerful a silence at a concert. The palpable quality of the hush reminded me of the graveyard near my grandmother’s cabin in Montana. The graveyard has a dozen or so folks buried, many of whom had only wooden headstones. Those names are now rubbed away. All ten or 12 individuals — including a baby lastname, and a man with a great ghost story/cautionary tale about not taking a dead man’s remains — were all buried in the late 19th century. They died of diphtheria, and they were tucked away in the mountains to prevent the disease from spreading. It’s a strange place, almost pine forest again. The old fence is almost rotted back into the earth. Nature is winning over man, and that provokes big, scary thoughts on being human when you visit. But it’s also a beautiful spot to spend forever, even if your forever means only your bones in the ground. That graveyard also contains the biggest, loudest quiet I have ever heard. The air of the place seems charged (“the very air come and go with me”). I grant that this feeling may come from my own head. I still feel it in my body each time I go there. Ralph, whose hand I shook after the show (I gushed a thank you, and a “you made my whole year!” He might have smiled a little, he certainly thanked me) got a lot of response from that uptight, Pittsburgh crowd. He stood for the whole hour and a half show, even though a chair rested on stage if he had needed it. His face was solemn, which he apparently always was even as a young, shy man. (He used to let Carter talk to the fans.) He mostly clasped his hands like a boy in church, as he waited for his turn to sing. He tried to demonstrate the old clawhammer power on “Shout Little Lulu.” That was the very first song he learned — his mother taught it to him. On Saturday he had it, then he lost it, and the band, all full of love, covered for him as best they could. And we in the crowd cheered for him. When we kept clapping and encoring, he thanked us all and blew earnest kisses. Ralph Stanley is not immortal. 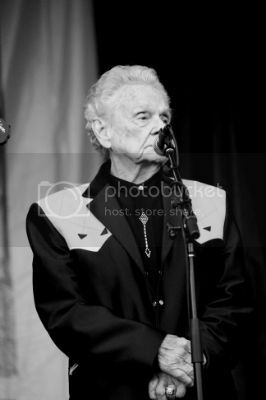 Ralph Stanley is fading away, as we all will if we’re very lucky. Ralph Stanley is not a living legend because he is old. You don’t clap for Ralph Stanley because you are kind. He is not a feeble relative to watch over and encourage like a child. You applaud because you are selfishly grateful that Ralph Stanley is here to carry all this music with him. He’s carries it for us, and he has enough of it to give. He calls his grandson his son, and his fingers aren’t nimble enough for the banjo, but on stage he can still go back to his boyhood, Primitive Baptist Church days and stand, hands neatly folded, and do what he was born to do.